What? In today's environment, the practice of remove and replace has become impractical from the standpoint of cost and environmental impact. A very popular reconstruction alternative is known as Full-Depth Reclamation (FDR). 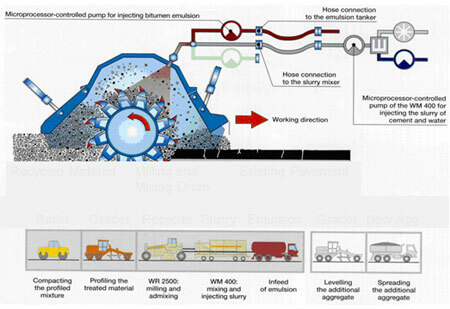 FDR is an in-place recycling method for reconstruction of existing flexible pavements using the existing pavement section material as the base for the new roadway-wearing surface. This process can include adding chemicals to the base layer in order to increase its strength capacity. The treatment of the base layer and recycled asphalt provides a stronger foundation for present and future traffic. This process effectively produces a cost-effective solution that maximizes limited budgets. The new chemically treated base section provides engineering benefits that perform as a foundation for the new wearing surface. These benefits include higher unconfined compressive strength than the previous unbound aggregate base material, and lower permeability of the treated base which reduces the influence of water, the main reason for premature pavement failures. Stabilization of the reclaimed pavement can be done by mechanical, chemical, or bituminous means. For increased stabilization requirements, combinations of all three can also be used. Why? The advantages of FDR are considerable compared to remove and replace reconstruction. It provides the benefit of being equal or better in performance while also minimizing the consumption of fuel and natural resources. FDR treats all types of failures to the highest severity. It eliminates ruts, rough areas, and pot holes. It also eliminates alligator, transverse, longitudinal, and reflection cracking. 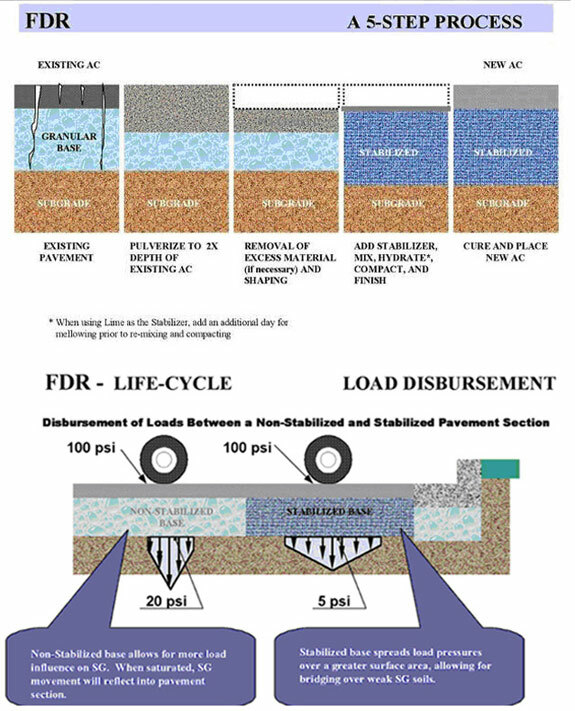 In addition, it FDR restores the grade contours to allow for better surface drainage. When? 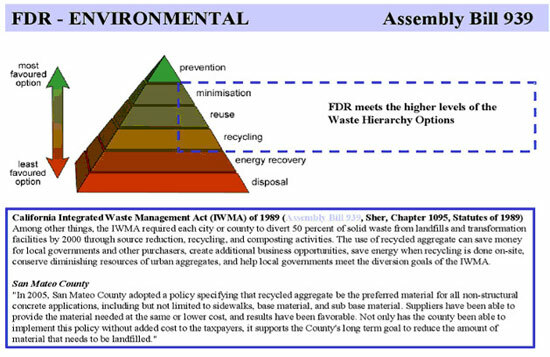 FDR can be performed in place of traditional remove and replace reconstruction. FDR takes cold in-place recycling to the next level by grinding up the old pavement and using it as a stronger foundation for the new roadway. This is beneficial in cases where reconstruction is necessary in order to increase the structural capacity of the roadway due to increased vehicle traffic.